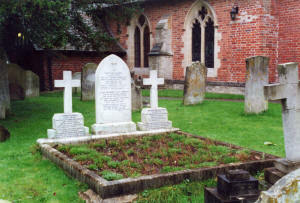 Matthew Arnold is buried in the family plot in All Saints' Churchyard, Laleham, Middlesex, England. Arnold was the son of Thomas Arnold, a Headmaster of Rugby School. He was educated at Rugby, Winchester and Balliol College Oxford. In 1851 he became an inspector of schools - a career to which he dedicated 35 years of his life. His early poetry was heavily influenced by Byron. His first collection was entitled The Strayed Reveller, and Other Poems and was published in 1849. In 1858 Arnold was appointed Professor of Poetry at Oxford University - which was ironic as he spent the rest of his life writing prose. He particularly concentrated on educational, literary and social topics and became one of the most influencial critics of his day. His critical work inspired T.S Eliot. Arnold died in Liverpool in 1888 whilst awaiting the arrival of his daughter from America. He was running for a tram car in the city when he suffered a heart attack. Arnold is commemorated with a bust in Poets' Corner, Westminster Abbey.